One of the best rated taxable bond mutual funds is TCW Core Fixed-Income N. This fixed income fund has a consistent long term performance. More details about the fund review can be found below. The TCW Core Fixed Income fund seeks to maximize current income and achieve above average total return consistent with prudent investment management over a full market cycle. This TCW fund invests most of net assets (>80%) in debt securities or bonds. These debt securities include but are not limited to securities issued or guaranteed by the United States government, its agencies, instrumentalities or sponsored corporations; corporate obligations (including convertible securities); mortgage-backed securities; asset backed securities; foreign securities (corporate and government); and other securities bearing fixed or variable interest rates of any maturity. It may also invest in junk bonds or high yield bonds. Tad R. Rivelle has managed this taxable bond fund since December 2009. This TGFNX fund was officially introduced to public in March 1999. The expense ratio of this fund is 0.78% per year. It charges 0.25% 121b fee, but there is no front end or deferred sale load. It also has a yield of 4.23%. The last dividend distributed was in June 2011 ($0.04). This fund uses Barclays Capital U.S. Aggregate Bond as the fund’s benchmark. The fund’s effective duration is 4.3 years, and the fund’s average maturity is 6.4 years. The minimum balance to invest in this bond mutual fund is $2,000 for brokerage account and $500 for retirement (IRA) account. This fund requires $250 for the minimum subsequent investment. This fund can be purchased from 87 brokerages, such as Merrill Lynch, JP Morgan, T Rowe Price, TD Ameritrade Inc, Schwab Retail, Fidelity Retail Funds Network, Morgan Stanley Advisors, E Trade Financial, Vanguard NTF, etc. The other class of this fund is the Institutional Class (Ticker: TGCFX). The expense ratio of TGCFX is 0.44%. This TCW Core Fixed Income fund has received 5-stars rating from Morningstar as it since its inception, this best bond fund has always recorded positive return every year. The highest achievement within the 11 years of performance was in 2009 with 15.23% and the lowest achievement was in 2005 with 0.31%. This TGFNX fund has 3.51% YTD return and 8.68% of 5-year average return. Based on the load adjusted return, this best rated bond fund has returned 6.75% over the past year and 6.97% over the past decade. According to the fund’s prospectus, the Principal Investment Risks are: Interest rate risk, Credit risk, Price volatility risk, Junk bond risk, Prepayment risk, Derivatives risk, Leveraging risk, Issuer risk, Liquidity risk, Market risk, Foreign investing risk, Asset-backed securities investment risk, etc. Details can be found in the fund website. 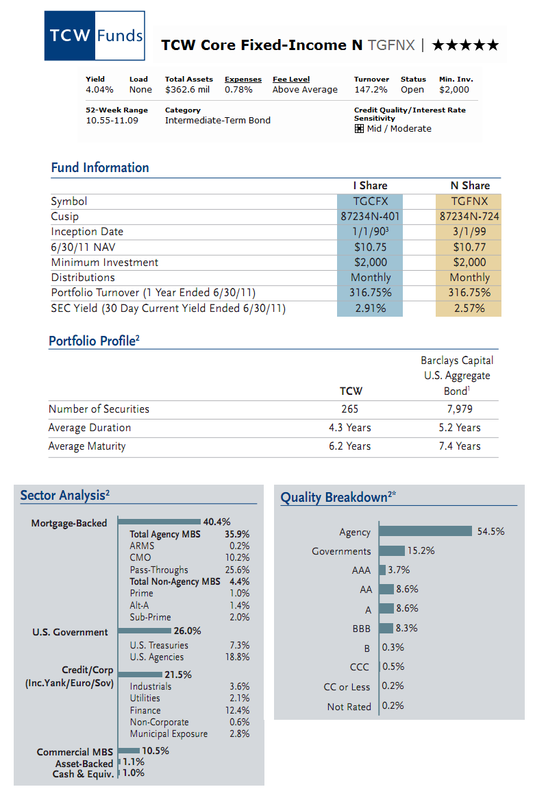 Another top rated TCW bond fund is TCW Total Return Bond Fund. This fund was managed by Jeffrey Gundlach before. Gundlach has opened a new fund, DoubleLine Total Return Bond.